There is no avail of the multitudes of qualification degrees if you are unable to apply what you have learnt in your life. The real outcome matters when you come into professional field where you have to execute your potentials, where you have to flaunt your talent, where you have to work hard, not just to earn yourself livelihood but because that is your stance, because you should love what you do and do all with your heart. One does not have to be a jack of all trades, take one field, pursue it with a great deal of euphoria, conviction and faith, don’t just jump into little and big things. Do something that pays you off and don’t get deviated from it. The end product should look like—that efforts have been injected in this & a thought is backing this up; also it should carry weight to build up an impression. For the learners and amateur designers; experts’ advice is always there that counts. Always look up to the work done by professionals so that not to plagiarize their work, merely by imitating their product but to seek main guidelines from their expertise and to seek inspiration from their masterpieces. It takes a lot of time to contemplate what you are supposed to do and how you are going to do that. 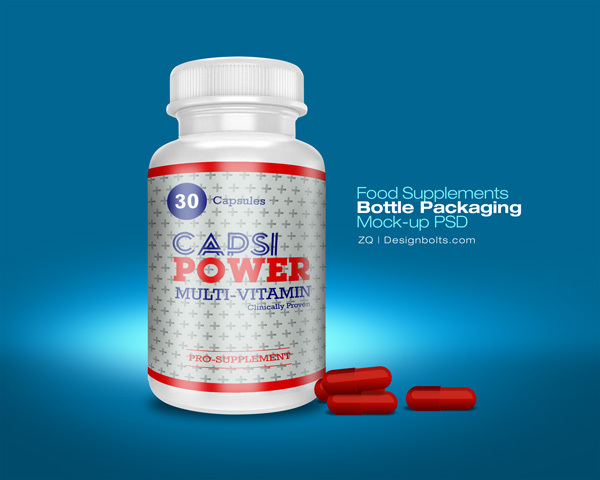 Today I am unfolding before you food supplement packaging bottle mock-up PSD. That you can use for personal prospects to show it off to the clients because presentation matters a lot. You just have to insert in your design (if you have to deal with a food supplement product design), furthermore for capsules, tablets, multi-vitamins and all kind of medicines, you can use this bottle mockup. Stick around for more posts that we are to unfold in future for you as well. We aim to please you with all our heart. Subscribe us for more PSDs and mockups. For capsules, tablets, multi-vitamins and all kind of medicines. Thank you very much for the great bottle mock up!!! Thanks for the freebie, helped me a lot! This is awesome work! Thank you very much for taking time to share something that I know you put serious hours on. I appreciate people like you taking the time to share your talent and expertise with most of us who are just learning the ropes. Again THANK YOU!!! You are most welcome ERIC. Your comments means a lot. Hope you will like my freebies in future as well. Thank you very much. I want to use this mock-up for my display of selling designs. Great work! Thanks a lot!!! Just double click on the layer “Place Design” and paste your design, after that save and close that window. I really like this supplement bottle, I’ve tried doing the same mockup as this one but without success. I found this mockup on web site and Licence is free for personal and commerial use. After I found that you are Author I saw that I have to link to your site if I use this for commercial use. My Client likes this bottle very much and would use this bottle in his web shop. Can I please buy bottle from you to use it without obligation to pointing your web site? Wow man, thank you really!! What a beautiful work! Thanks for sharing. Thanks – These are the best bottle mock-ups around! !